Combine cream, garlic, herbs, and onions in a medium saucepan and bring to a simmer over low heat. Continue to cook over a very low flame until garlic and onion are very soft, 30-40 minutes. Strain mixture and season with salt, pepper, and freshly grated nutmeg. Arrange squash in a 9” by 13” baking dish, seasoning each layer with a little Parmesan cheese. 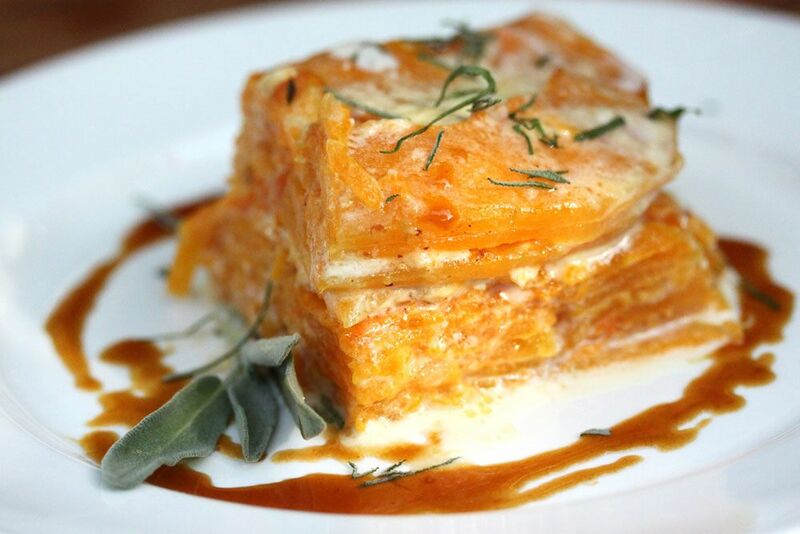 Pour the infused cream over the layered squash and season the top with more Parmesan. Allow the ingredients to settle for several minutes. Bake the gratin at 350 degrees until squash is very tender and cream has been absorbed. Let the gratin cool for at least 20 minutes before serving.